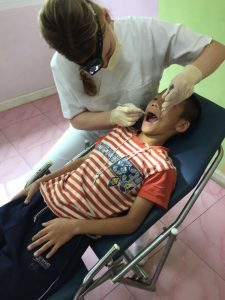 In February we had 7 German dentists at the orphanage, checking, cleaning and treating all kids! A great donation and great experience. 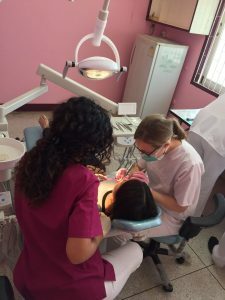 We have learned a lot to give the kids a better understanding for their teeth, but there is still a lot to do. From 18.2.2018 to 3.3.2018, dental check-up of majority of the students in the aforementioned schools was conducted and the results of each student were recorded on an examination form. At the same time, necessary and feasible treatments were carried out in the local infirmary. 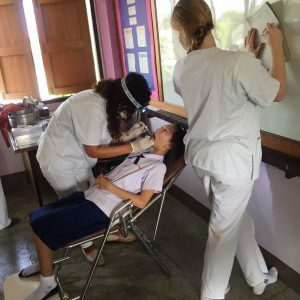 The project was carried out in cooperation with Iceman Charity and Dental Volunteers e. V. There were 5 dental students and 2 dentists on site, who were supported by Thai dentists and dental technicians. The following results were recorded. Out of the 1,496 students examined, 530 students had a caries-free set of teeth. This group includes all untreated caries-free sets of teeth as well as treated children with adequate fillings. It also includes the students who were treated with a prophylactic fissure sealant. These are 33 percent of the 530 students. 966 students out of 1,496 had acutely damaged sets of teeth. This includes all students with active carious lesions on milk and/or permanent teeth, defective fillings, teeth that have already been destroyed completely and teeth that are missing due to caries. During the examination, it was conspicuously noticed that only a minimal number of young students had healthy milk teeth or mixed dentition. The vast majority of students already had deep carious lesions on their milk teeth, which indicates incorrect or lack of brushing behavior. In this context, it is also worth mentioning that massive crowding, breakthrough disorders, retentions, incomplete re-absorption of milk tooth roots and general malpositioned teeth have often been observed, which are due to decayed and destroyed milk teeth that are unable to perform their function for the orderly breakthrough of permanent set of teeth. A low number of 6-7-year old students (1st permanent molar tooth that is just broken out) also had a fissure sealing of all necessary teeth. In combination with the aforementioned problems in the children’s brushing behavior, the large number of carious lesions in adolescent age can be easily explained. The number of students listed in the statistics who have received a fissure sealant on at least one permanent tooth and still have carious lesions should indicate that a sealing of all permanent molars is necessary. In almost all of these cases,only the unsealed teeth were carious. 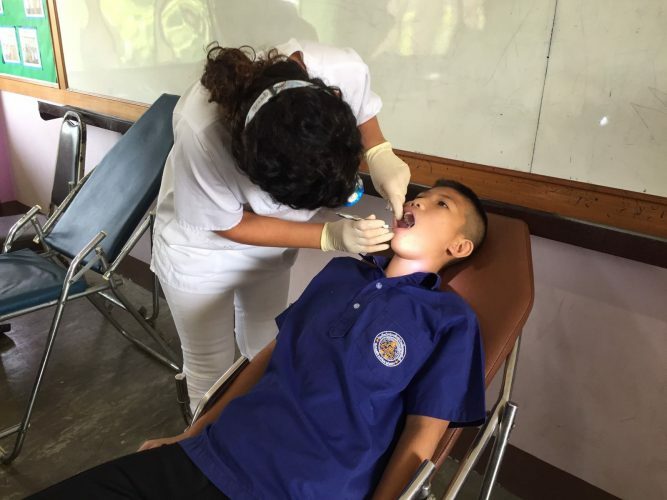 While talking to the students, it also became clear that a significant number of students do not have a toothbrush or only a common toothbrush and do not always have access to a toothpaste. In most cases, the available toothbrushes are so worn out that they need to be replaced immediately. Furthermore, the amount of sugar-containing food and beverages that the students can buy and consume before, during and after school was striking. The impression arose that there was no awareness of the connection between nutrition and the development of caries and that owing to such nutritional behavior, a corresponding comprehensive dental care must be carried out. 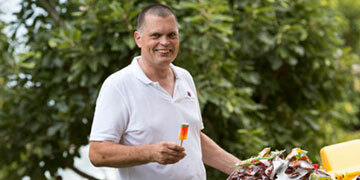 Probably, there is no general information about teeth, their health and the importance of care. This could be noticed even during a visit to the kindergarten of the temple. Repeat explanation at the beginning of school and at the age of 12 years, when all permanent teeth are in place. Urgent requirement for treatment for children with destroyed teeth à extraction!! Returning the screening sheets to the classes and discussing the results so that the children are informed about their condition.